At a special Stake Meeting today, 20 January 2019, Stake President Jean Luc-Butel announced the re-organization of the ten wards in the Singapore Stake..
Two wards, the Second and Third Ward, remain unchanged: Jacob Soh continues to be the Bishop of the Second Ward while Gremer Sempio, previously the Bishop of Choa Chu Kang Ward is the new Bishop in the Third Ward. 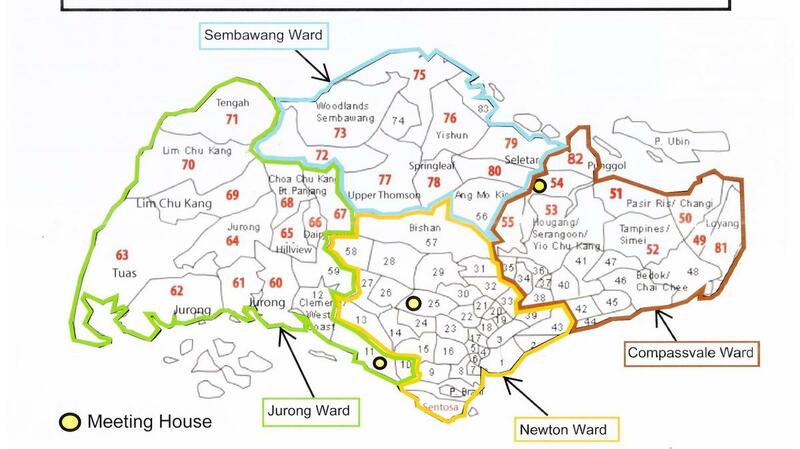 The following eight wards were discontinued: Ang Mo Kio, Bedok, Bukit Timah, Choa Chu Kang, Clementi, Toa Payoh, Woodlands and Yishun. A new Young Single Adults (YSA) Ward was created with Cade Napierski as its Bishop. 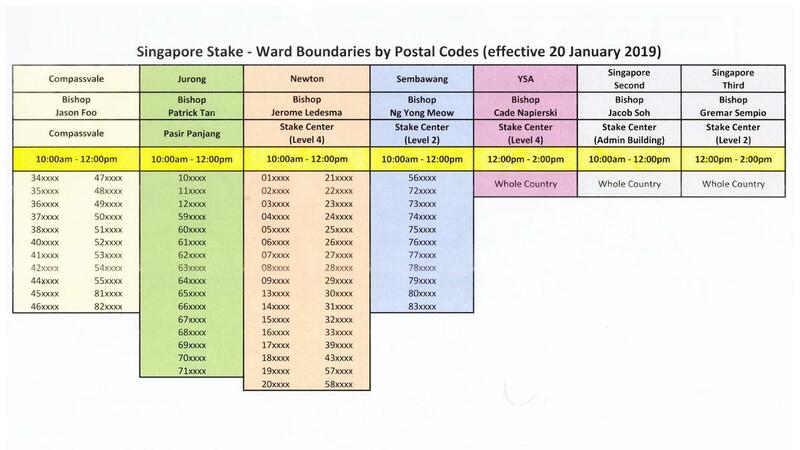 It will meet at Level 4 of the Stake Centre from 12.00 noon to 2.00 p.m.
Four new wards were created: Compassvale Ward (with Jason Foo as Bishop, meeting at the Compassvale Chapel at 10.00 a.m.); Jurong Ward (with Patrick Tan as Bishop meeting at the Pasir Panjang Chapel at 10.00 a.m.); Newton Ward (with Jerome Ledesma as Bishop meeting at Level 4, Stake Centre at 10.00 a.m.); and Sembawang Ward (with Ng Yong Meow as Bishop meeting at Level 2, Stake Centre at 10.00 a.m.). The changes take effective immediately.